In the Greco-Roman world the use of ‘medicine men’ (pharmakai) was common for the poisoning of your political opponents, inducement of paranormal experiences and obtaining toxic herbs to induce abortions. Abortion was not the only problem that led to the downfall of Rome, but also infanticide. Romans who didn’t want a child would place it on the walls of the city and at night the child would be devoured by any passing beast that might be looking for a meal. 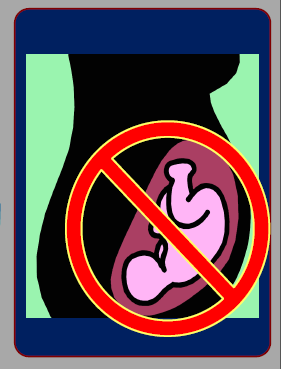 With 1 million unborn humans aborted each year in the United Sates of America and 1 hundred thousand per year in Australia I’d say the current so-called enlightened Western liberal democracies are worse than the old pagan Roman republic. Paganism is back in full force. Those who commit such heinous acts cannot inherit the kingdom of God. They cannot be saved; they cannot be redeemed from Hell, unless they repent. Pharmakeia is a form of the Greek root from which we get our English words ‘pharmacy,’ ‘pharmacist,’ and ‘pharmaceutical.’ Pharmakeia means having to do with the use of medicine, drugs or spells, which is understood to be closely allied to sorcery. The Apostle Paul was not speaking of what you might typically imagine as witches and witchcraft but of medicine men and women who practiced their ‘science’ with mind and body altering drugs. Pharmakeia connects drug addiction with sorcery. Modern use of pharmakeia once again has become more like sorcery. 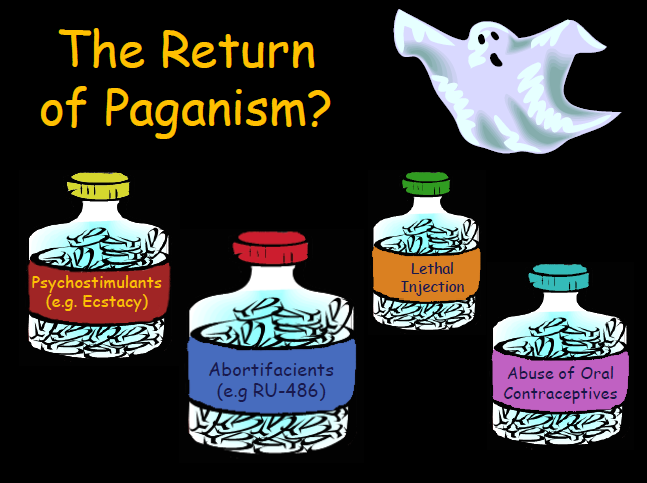 Many forms of sorcery are practiced today, which include contraceptive drugs to stop ovulation, or drugs used to kill the zygote (the just fertilized egg) as with abortifacients, the RU-486 abortion pill, for example; or psychostimulants, like Esctasy; or many forms of other illicit drugs like methamphetamines, marijuana etc. This modern trend seems to characterise a return to the paganism of the Romans. It is also worth noting that because king Saul rebelled against God equated his actions with witchcraft or sorcery and conjuring a vision, which resulted in him losing the kingdom. So for Christians to condone or use these types of drugs, they are condoning or using sorcery, which is an abomination to God. This entry was posted in Biblical doctrines, Trials and temptations, Worldview and tagged abortion, illicit drugs, infanticide, John Hartnett, marijuana, medicine men, methamphetamines, pagan, pharmakeia, Roman Empire, RU-486, sorcery, witchcraft. Bookmark the permalink.